Recently ProteusThemes crossed the $1 million threshold to become a Power Elite. We couldn’t be more proud of this bunch, and so to celebrate we bombarded them with questions about the way they work, why they do what they do, memorable client/customer stories and some people and Authors they admire and are inspired by. Enjoy these answers from Primož Zigler and the team! We are ProteusThemes and we’re based in a small country in southern Central Europe called Slovenia. Our team has 6 members: Primož, Jaka, Marko, Gregor, Lena and Jaka (there are not really that many people named Jaka in Slovenia). We are all full-time WordPress theme makers. How we came up with our name – ProteusThemes? 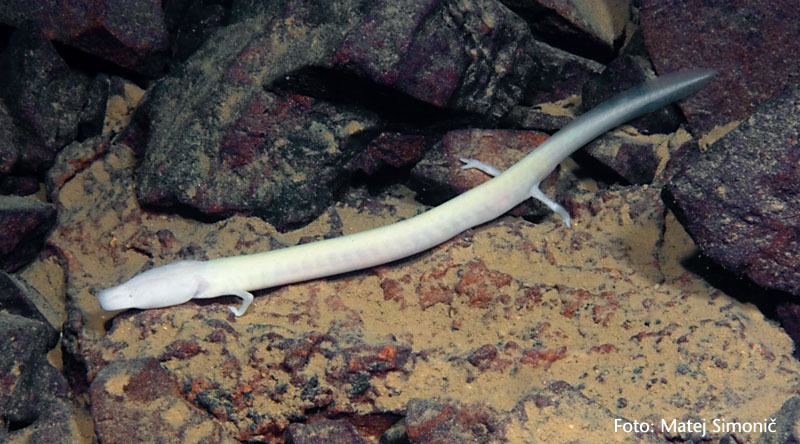 Proteus (also human fish) is a name for a animal that lives in a cave and is endemic in our region. It kinda represents Slovenia. I recently revealed about everything about how we work in this article the Community Blog. The other thing is that we’re a completely de-centralized team. Geeks would call us a “git team”. I often go travelling around and I am able to work from anywhere. Even though we have our own office, we are remote-first, which means all the communication by default is the non-blocking asynchronous Slack + Trello (geekish slang alert). Probably that we started rather young. Jaka was 20 and I was 22 when we joined ThemeForest. I don’t know how this compares to other Envato Power Elite Authors, but I have a feeling we’re on the younger end of the scale. Why are you doing what you do? What do you love about it? Jaka and I started tweaking the web as early as primary school. We were both freelancing: he was designing websites; I was programming while at school. We both tried lots of other ways to monetize before ThemeForest, like google ads or selling websites on Flippa. Nothing worked as well as ThemeForest did. So 3 years later, here we are, at this amazing milestone I never anticipated we would reach so fast. In general the buyers on Envato are not big-name companies. Or at least very very rarely. So it is hard to say that we had any special customer or put a Fortune 500 logo on our website. Especially as we create niche WP themes. Our clients are people whose main service is not happening online. They want to get things done, as nowadays you need a website or you’re out. But I think it is pretty impressive the number of how many small businesses we’ve helped to get online for a fraction of the cost compared to fully custom online solutions. If I had to choose one (a particular customer interaction), it would be when I went to London for a month last year, to work remotely and meet our clients, help them in-person with WordPress on-boarding. Only two companies responded; I anticipated a better response. But I met with these two and it was a great experience to see what the whole process looks like for our clients. It was great for them as I was there, available to answer all their questions on the spot. And it was great for us, as it is the best possible feedback to see how people use your product in real world. You need to keep yourself up to date and be constantly aware of what’s happening around you and in the marketplace. I think you need to be the type to embrace that. I am. For someone else this might be a nightmare and as a result your chances for success are probably much worse. When you start any kind of business you get inspired by great businessmen who have already made a fortune. But as time goes by you see that persistence is really the key that makes you successful in the long run. In that case, the most inspiring people to me are athletes. From an early age they’re waking up before school to go to practice, go to school, come home, do their homework, study, do more practice and go to sleep; every day, year after year without any guarantee that they will ever make a dollar from it. They just do what they love the most and they develop a routine. That’s one of the most important things if you want to succeed in life and that is a great inspiration for us. Don’t do the same as everyone else does. If we went niche and flourished, it doesn’t mean you should too. Don’t go multipurpose either. Maybe there is something else youand only you know and feel should exist – go for that! Yes and no. Slovenia is an absolutely stunning country (I am probably biased, ask people who have travelled to Slovenia). The quality of life here is in my opinion one of the best in the world. On the other hand we pay high taxes that are not spent wisely. But then – name one country that doesn’t have such problems? When I was younger I had a plan to move out of Slovenia as soon as I finished my studies. Top on the list was Australia. Later on, after I visited Australia twice, I was not so sure anymore. Not that I dislike it, far from it. I absolutely adore it. But reasonable taxes and government isn’t everything. My family is in Slovenia, my friends are here. I can do the stuff I like, go windsurfing to the seaside or snowboarding over the weekend. Not a lot actually. The people who buy our products, use them and are satisfied with them are the best evangelists for ProteusThemes. GetBowtied are (apart from us 😉 ) probably the best author on Themeforest. We like them because they have very similar mission/business model as us. Like we do only small-business-niche-themes, they do just e-commerce themes and they are the best at it. Also, we always like Authors that go the extra mile when it comes to the level of design details. There are six of us and we all figured out a long time ago that hobbies fulfilled the gap between career and personal life. Primož for example windsurfs a lot, Jaka Š. is practicing mixed martial arts, Gregor has been playing football since forever, Marko has an important job at scouts, Lena sews her own clothes from scratch and Jaka J. can’t imagine a day without visiting the gym. Wow, we did it, man!! !